When Motherhood happens, it happens with a vengeance. We all know of, have heard of (or talk about) the infinite joys of becoming a parent, the unmatched love filling us from head to toe for our little ones and the daily struggles of being a mom, but what about the never-expiring cop-out card many of us cling to as a result of our new role? 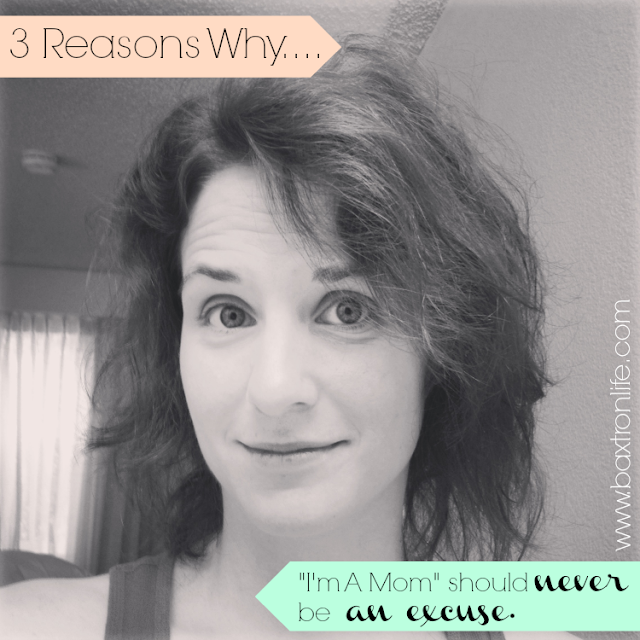 I'll admit to you now, I'm guilty of using the "I'm A Mom" excuse, even when its just that, an excuse. If I'm being completely honest, sometimes the reason I don't attempt to style my hair or change out of sweatpants has less to do with the reality of the woefully exhausting daily grind of raising a little person and a whole lot more with my own choice to deprive myself the required 7-8 hours of shut-eye so I can catch one more episode of MasterChef in my Hulu queue. Of course, I can blame my need to stay up watching that one last episode on the challenges of that day and needing to "decompress" but really I'm just making an irresponsible decision for myself knowing I am one of the crankiest people alive when I'm running on less than 8 hours of sleep. Before I offend anyone, let me shoot straight with you. At times, being a mom is one of the most demanding and difficult jobs on the face of the planet. And at the same time it is one of the most rewarding, exciting and awesome jobs you'll ever have. But at what point does it become okay to use your role as a mother as an excuse to neglect yourself, your relationships or even your hopes and dreams? Hey you! Yeah you - not mom, not wife/partner/etc. just you. I'm talking to the person who existed before the other people in your life became your top priorities. You need to take care of yourself. You need to make it a priority to get sleep, get exercise and eat well. You need time for yourself to relax and enjoy your own hobbies. Someone slipped a big fat lie into your ear the minute you became a Mom and it went something like, "You must take care of everyone else before you take care of yourself." But it is a lie - you just simply cannot continually and exceptionally take care of other people if you are letting yourself fall apart. And if you struggle with the idea of being "selfish" for taking time for yourself - remember that your example of how you care for yourself is going to be widely observed by your offspring. And they may even observe your burnout if you don't start taking steps now to change your habits. Don't over complicate this step - and don't immediately use the cop out that as a Mom you are too busy. Make these things a priority by involving your kids in your physical activity, cooking and meal prep and even nap when your kids nap if it means you getting the extra rest you need. Sometimes other hobbies and television watching need to be shelved in order for you to take care of your true needs. And yes, even cleaning can sometimes wait!! I know that this is an area that I personally struggle in. It doesn't matter if you are a working, work-at-home or stay-at-home mother - truth is you are working harder than many people, with longer hours, and very little breaks. You are tired and sometimes beyond spent when you clock out in the evening. It is easier to let yourself go or to put your most important relationships on the back burner when you feel constantly burdened by the workload. Even so, your marriage, or relationship with your significant other is extremely important, not only for the sake of the family but also for your personal well being. Don't use the trenches of motherhood as an excuse to neglect your relationship with your best friend and partner in life. I have three suggestions to counteract the tendency to only give your leftovers to the man in your life: first, minimize screen time, especially in the first hour that you guys reconnect after work each day. Put phones down, greet each other with warmth and love (regardless of how your day was). In addition to this, set time aside to talk with one another. It is not enough to just slump down on the couch together and stare at a TV until bed time, you need to keep the lines of communication open. Secondly, get a weekly date night going. Alternate responsibility for planning the dates so that you both keep the "surprise" and thrill of when you first got together. Have one person plan the date, the other make babysitting arrangements, then switch it up from week to week. Better yet, get a regular date night sitter - or swap with another couple and give them the gift of a weekly date night as well. Having a regular night away from home to kindle the romance is essential to maintaining a healthy relationship. Lastly, make the effort to look your best, whatever that may be. 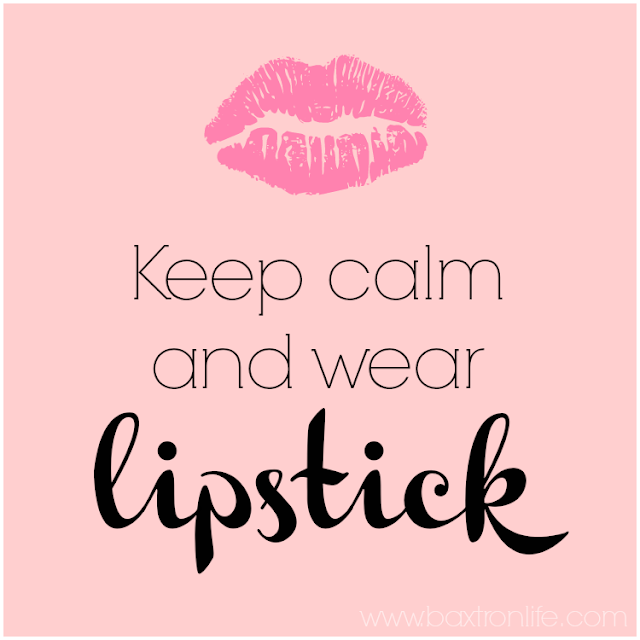 This ties into taking care of yourself, but goes as far as doing your hair, wearing clothes (besides yoga pants) and maybe applying a bit of makeup. Not only will this help your husband to stay attracted to you, it will also surprisingly make you feel a lot better about yourself. When you look good, you tend to feel better about yourself, have more energy and get more accomplished. 3. Your Dreams Are Worth Fighting For. When I was dating my husband, I came to realize that one of my deepest dreams was to be a wife and a mother, a dream that I was, at the time, afraid to entrust to God for His timing. Fast forward just years later and I am married and a mother of a wonderfully spirited little girl. Now that these dreams have come true, my heart still aspires to use the talents and abilities that God gifted me with for a purpose. The trouble comes when those dreams get put on the shelf indefinitely, and the daily grind takes over. I believe we are dreamers for a reason. I believe that each of us are given talents and abilities to inspire others, make the world a better place and leave a legacy for future generations. It troubles me that so many women I've spoken to have almost completely lost sight of their passions and dreams, in the shuffle of responsibilities that motherhood and marriage bring. Not only are these women missing out on a deeply fulfilling part of their life, but the world is missing their contribution. I once heard a motivational speaker talk about the path to reaching one's dreams - for her it was writing a book. She had never written a book before but rather than letting the overwhelming task of answering the question of "how" she decided to just learn the process as she wrote. She is now a published author and an inspiration to many women looking for direction on how to take that first step. There is definitely a purpose in your role as a mother and/or wife, one that takes up a huge amount of time and is worth every minute invested, but you also likely have other gifts, desires and passions that are worth pursuing. Ask yourself what baby steps you can take this week to move in the direction of one of your life dreams! Remember, dreams don't fade unless we let them. Of course, there is no judgment whatsoever here. If you are in one of those seasons of struggle where it seems that no matter what you do, you can barely keep your head above the water, know that this post is meant to encourage you to do what you can, not what you cannot. Life is, after all a great balancing act - but motherhood was never meant to be an excuse for settling for less than you deserve. So if you've been using it as that, my challenge to you is that you would start making a change today. Really well written post and it sounds like we're living the same life. So many times I stay up for one more episode on the DVR because I feel like that's the only time I get to myself all day and I will admit there's times I have to ask myself- when did I shower last. I really am learning to balance what is the best but the hardest job I've ever known being a mother while leaving something for myself and my husband. 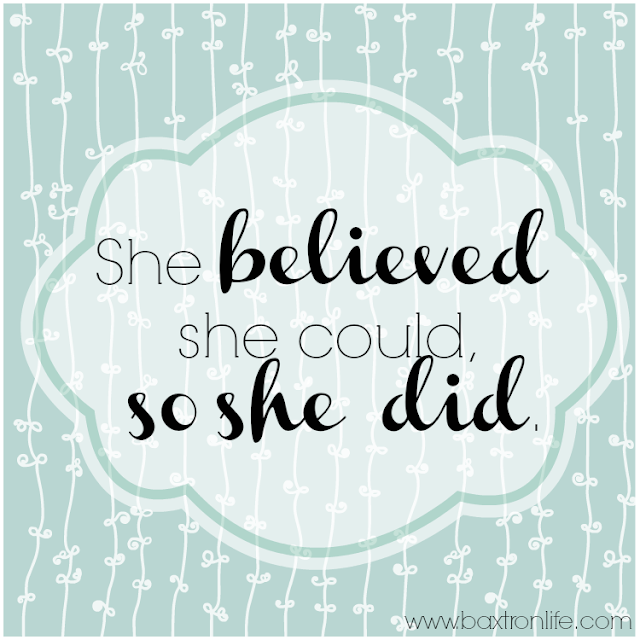 It is honestly a post I had to write to remind myself of these things! I know how I feel when I am doing it right and I know how I feel when the opposite is happening. I'm aiming for 90% as I know it is impossible to get it right 100% of the time! What a great post & LOVE your pics!! This is exactly why I'm finishing nursing school and this is my last semester! I could say "Oh no, I don't have time because I'm a mom." But that would be a cop-out. I DO have time, because I know to make time for ME and follow my dreams! This post just took all the words right out of my mouth and wow... what a great read! So well written, Courtney! I think this is one of my favorite posts you've done! I totally had to write this post because it is so hard for me to not use my role as a mom and a wife for an excuse - I needed to have reminder! Glad you relate! Love it! As a working mom I can't imagine all the work that goes into being a SAHM, well maybe I can and that's why I choose to keep working? 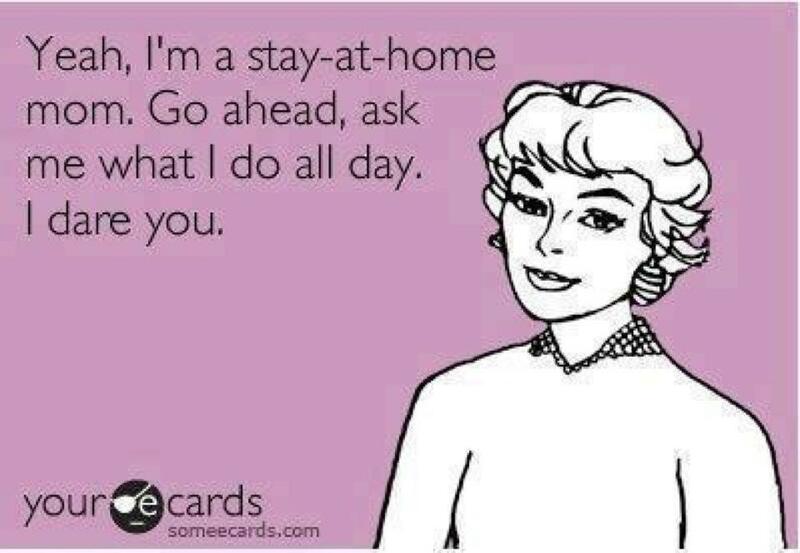 ;) I admire SAHM's and the fact that you say that you can't use it as an excuse, in my book you totally could, and that makes me admire you even more! 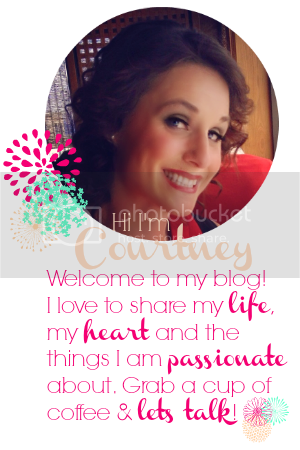 Great post Courtney! Wow, this has to be one of the best posts I've ever read! I definitely do think that moms have to put ourselves first at some point. I'm doing that today, I have a baby sitter and I got myself a Venti Pumpkin Spice Latte. Sure I'm working right now, but it's still a lot more me time than I get when my little one is here!